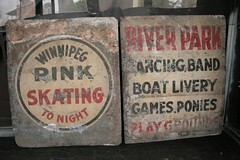 On Sept 19th, 2010 a half hour film called Backtracks: The Story of Winnipeg’s Streetcars, was premiered at Cinematheque. You can watch this film for free on MTS TV’s “Winnipeg on Demand”. 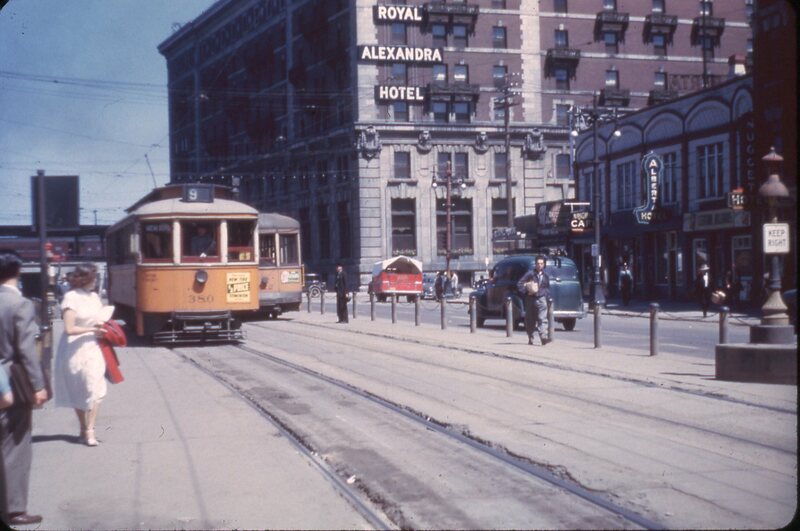 From the Provincial Archives of Manitoba, I have compiled a excerpt’s from old movie films, with Streetcars moving through Portage and Main, from around 1920- 1950’s. Also pedestrians, traffic, and the old buildings are in the background. Enjoy! Another intact Streetcar found in southern Manitoba. 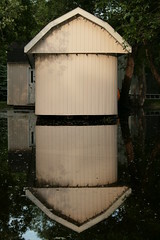 It’s been covered and protected, and was used as sleeping quarters. It’s not usually surrounded by water though! At Danny Schur’s Replica streetcar 596 last weekend during Open Doors, 2 authentic streetcar signs were donated. Danny Schur’s Replica for the Strike! musical is inbetween Fort and Garry st, on Broadway, North side. It’s open during the day from 12-6pm and gives a brief history of the 1919 strike and the streetcar history and restoration project for 356. Stop by on your stroll down Broadway on your way to the hot dog vendors. 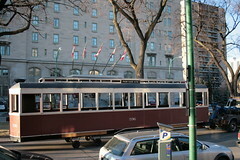 Danny Schur’s replica streetcar has been moved to a new location on Broadway, across from the Hotel Fort Garry. Streetcars of any sort haven’t been on Broadway since 1955. They rail lines went down the middle of Broadway, and the trees where used to help cover the overhead wires. Look for the Streetcar to be open during the day, for information on the 1919 Strike, some Streetcar 356 history, and for Danny Schur’s Strike! musical. 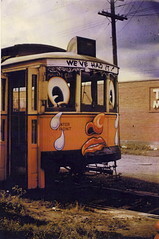 Found an old postcard photo of Streetcar 680. Looks like this must be a “loop” on Portage Ave, I’m wondering if its by whats now Polo Park. Note the “breezer” streetcar in the background. These were used in the summer months and were a very popular way to cool off from the heat. You didn’t take your jacket off back then. A very nice article about the project in the Free Press on Nov 27th . You can also email any information to winnipegstreetcar@gmail.com about the restoration work, or if you have any questions. Also visit the Millenium Library which has a streetcar display on the main floor until Dec 31st. The picture shows a Motorman’s coat, very heavy, weighs almost 50lbs! 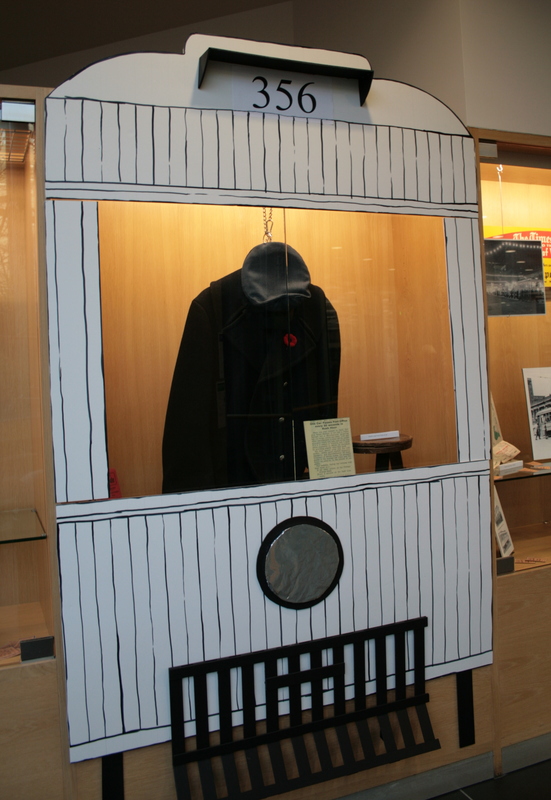 Thanks to the Winnipeg Electrical Museum for the loan of the coat and the Winnipeg Library staff who have done such a great job with the display. 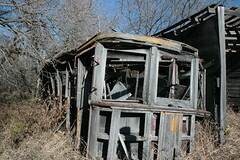 Another 2 Streetcars found, this one way south of Winnipeg in the Pembina hills. Seems there are always 2 of them as well, so I guess they were sold off in pairs back in 1955. This Streetcar is 384, not sure what the other number is. 384 was built in 1909 here in Winnipeg, at the Fort Rouge Shops, currently the home of Winnipeg Transit garage, more or less. Three Streetcars in a row, awaiting for passengers… or grain. The first one is a steel streetcar 726, at the far end. Then 2 older wooden streetcars built in 1910 at the Fort Rouge shops, 394 and 404 (closest to the camera). They were bought in the late 1950’s from a businessman in Winkler who purchased several of them to sell to local area farmers, for either grain, livestock, cash! Evidently to took a while to sell them. There in pretty good structural condition, with lots of original parts inside. 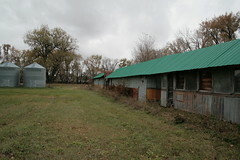 They are located on a farm ‘south’ of Winnipeg.